What are the special facilities availed by Agriya's Thumbtack clone script? 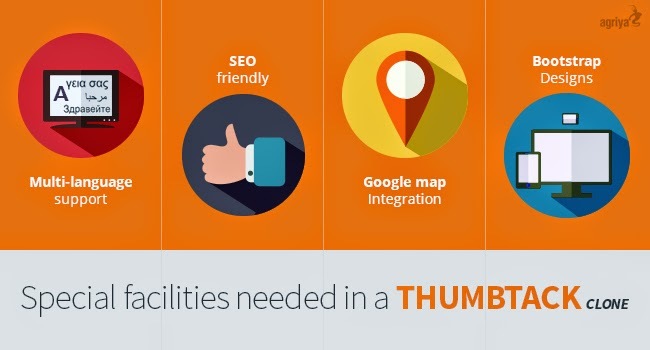 Thumbtack came into existence by creating an online platform for connecting local service professionals to the users who are in search of them perfectly. Do you want to depict the same business model and establish a service marketplace website in your own location? Then Agriya's Thumbtack clone script is the best ready-made package to create an excellent online business within 48 hours. This script supports your website with many exceptional features which are all indispensable to the website. Let's go through some of the special facilities availed by this script. Most of the users' preferences are to view the website content in their own local language. Website usability ratio increases when the website content is displayed in the regional language. By analyzing the importance of the language, this script imparted multi-language support to your website. You can translate the website content into your own regional language and attract more target audience to the website with ease. You can run the website with one language at a time. Online marketing is a key factor for increasing traffic and running a profitable service marketplace website. This script specially crafted all meta characteristics to your website which helps you to create seo-friendly URLs for each and every page of your website effectively. You can make use of this on-page optimization technique to create a search engine-friendly website to gain the highest rank position in the Google search results. Integrate every service listed in your website with the Google map, which assists the users to search out their own service professionals available near location easily. This option lessens the work of users and creates a user-friendly atmosphere in your website to attract many new users to the website. Make the users to conveniently operate your website with any kinds of devices like laptops, tablet, desktop and smartphones with fine screen resolution. This feature assists to create your website with a responsive web design layouts effectively. Likewise, there are numerous crucial features provided by this Thumbtack clone script. You can take a look at Agriya's official site to know all key details about this script.